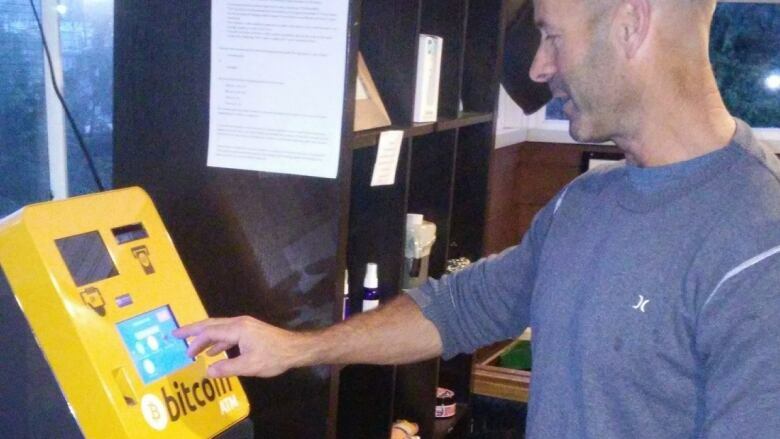 The first bitcoin ATM north of Pemberton, B.C., has been installed in Prince Rupert as the value of the digital currency reaches record highs. As the value of bitcoin hits record highs, Prince Rupert has become the first city in northern B.C. where investors can visit an ATM that dispenses the digital dollars. The decentralized digital currency is hovering around $8,000 US, although the prices are highly volatile and the money can sometimes be hard to spend. That hasn't stopped Mike Whitford, though. The Prince Rupert man found a small group of investors to purchase the bitcoin ATM and install it in Cowpuccino's Café. "This is just so exciting," Whitford said. He was a relatively early investor in Bitcoin, and he's converted various friends and family members into buying the currency themselves, but he found the options available for doing so limiting. "Basically, it was just taking a lot of time out of our day to help all these people," he said. "We figured if we got an ATM up here it would eliminate any of the risk factor with people having to put information online to websites that weren't necessarily truthful." The ATM allows users to exchange Canadian or other currencies for a QR code that will transfer digital currency into the user's account. The world's first bitcoin ATM was installed in Vancouver in 2013 and since then they have moved into Victoria, Kelowna, Whistler and Pemberton, but, until now, nowhere as far north as Prince Rupert. The fact that the machine has been installed at Cowpuccino's is fitting, according to owner Judson Rowe. In the 1990s, he installed one of the city's first publicly accessible internet-enabled computers. "Nobody really knew what it was, what to do with it," Rowe recalled. "Sure enough, years later, internet-enabled cafés were all the rage." Rowe said he wouldn't be surprised if one day digital currency is as ubiquitous as the internet is now.